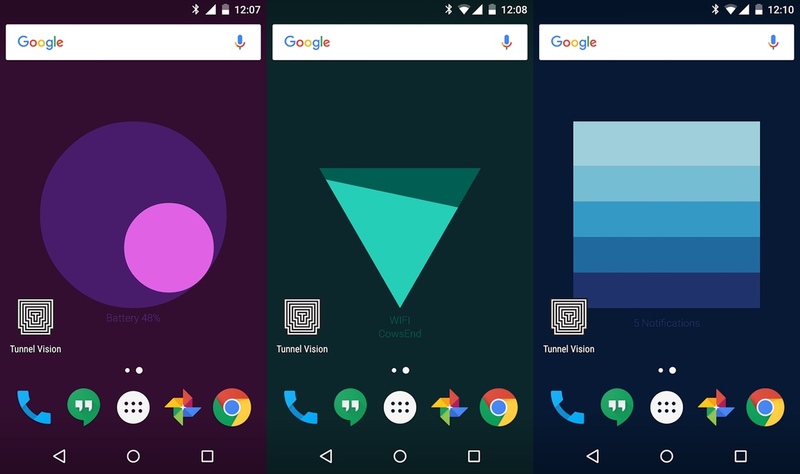 Google is tinkering again, this time bringing a live wallpaper that may actually be useful. Meter, a project from Google’s Creative Lab, will tell you when you might want to charge your device or use cellular instead of Wi-Fi. Conceptually, the wallpaper also acts as a widget, which displays information like battery level, app usage and notifications.. It also leans heavily on Material Design, because all modern Google-y things do. Meter is applied like any other wallpaper, but asks for permissions like an app (you’ll have to grant it full functionality). The wallpaper cycles randomly between views each time you turn it on, so you might be out of luck if you want to know the battery level at a glance. The battery wallpaper is a circle, which shrinks inside of a shaded outline as your charge dwindles. The inverted triangle shows your Wi-Fi signal strength, and the gradient bars show which notifications are waiting for you. It’s free to download, and as a Creative Labs project is available on GitHub for any developers who may want to tinker with it to create their own apps.